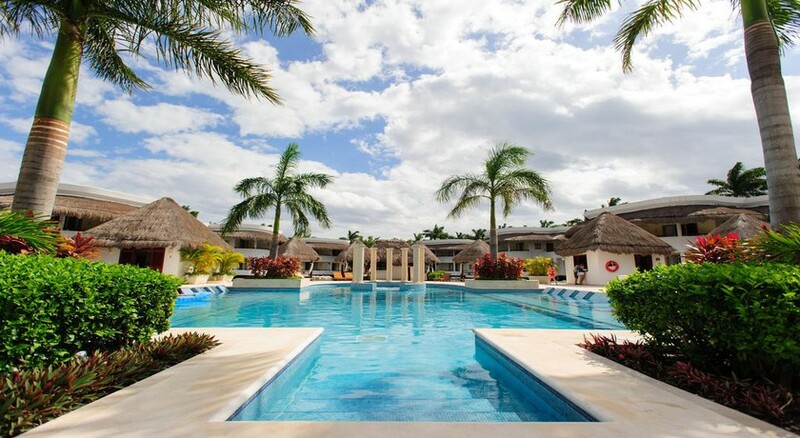 From the magnificent stretch of perfect white sand, to the 12 luxurious swimming pools and eight gourmet restaurants, everything is 'grand' about the Grand Riviera Princess All Suites Resort – a fantastic all-inclusive resort. 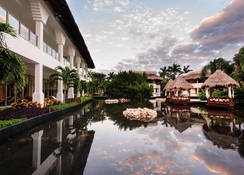 Modern, stylish hacienda-inspired rooms are nestled amongst lush, tropical gardens lined with palms along Mexico's stunning Riviera Maya. With so much on offer from exciting water sports and beach activities to lively evening entertainment and endless cocktails, the Grand Riviera Princess is waiting for your family and loved ones to experience the holiday of a lifetime. The Grand Riviera Princess All Suites Resort is located on a lovely beachfront surrounded by powdery-white sands and clear turquoise waters. 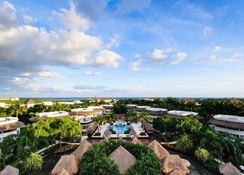 The hotel is about 10km from Playa del Carmen and takes about 25 minutes; 50km from Cancun International Airport. Just 4km away from the resort lies the El Cameleon Golf Club. 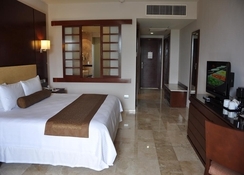 Grand Riviera Princess All Suites Resort offers 674 rooms notable for elegant design, spaciousness and family-friendly facilities. Few of them also have direct access to the swimming pool. The suites are categorised as Junior Suite, Junior Suite Deluxe, Junior Suite Deluxe – Swimout, Laguna Villa Suite, Platinum Suite, Family Club Deluxe Jr and Family Club Deluxe Jr – Swimout. All suites come with flat-screen satellite TV, minibar, sofa bed and en-suite marble bathroom. 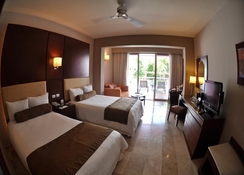 There are 12 restaurants to choose from at Grand Riviera Princess All Suites Resort. Green and Orange are the hotel's main buffet restaurants serving international themed breakfast between 7am – 10:30am, lunch between 12:30pm – 3pm and dinner between 6pm – 11pm. La Vaqueria is an international grill restaurant open for dinner between 6pm – 11pm. Mama Mia is an Italian themed restaurant open for dinner between 6pm – 11pm. La Hacienda is a Mexican restaurant open for dinner between 6pm – 11pm. Snack Sunset and Snack Riviera restaurants are buffet restaurants open for breakfast between 7am – 10:30am and lunch between 1pm – 3pm. La Fondue is a speciality Swiss inspired restaurant open for dinner between 6pm – 11pm. Miso is an Asian restaurant open for dinner between 6pm – 11pm. Las Olas is a seafood restaurant open for dinner between 6pm – 11pm and Le Fleur is an international gourmet restaurant open for dinner between 6pm – 11pm. There are 24 lovely bars where you can chill with a drink. 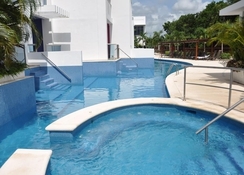 Grand Riviera Princess All Suites Resort has eight main swimming pools including some with Jacuzzis and four dedicated children's pools. Fully equipped fitness centre and spa are available offering a range of treatments and therapies at an extra charge. There’s a kid's club including daytime and evening activities, teens club and non-motorised water sports including kayaks, snorkelling, archery, tennis, basketball, football, shuffleboard, aerobics and a video games room. Regular evening entertainment including live music, shows and themed nights are hosted. Guests can let their hair down at Disco Arieto. All in all a great resort. There were plenty of a la carte restaurants as well as the buffet. The room was spacious and had a jacuzzi bath. The pools weren’t over crowded and the pool bar staff were great and getting any drink you could think of. The only slight negative was the activity timetable wasn’t accurate so it was very much a case of being in the right place at the right time to take part. That said, the staff were friendly, the hotel was clean and well maintained and the beach was great.